Add between 2 ½ and 6 ½ gallons of water to the brewing pot, dependent upon the size of your kettle. Pour the crushed grains into the grain bag and tie the bag loosely. With the heat off, place the bag into 150º-155ºF water and using a spoon. 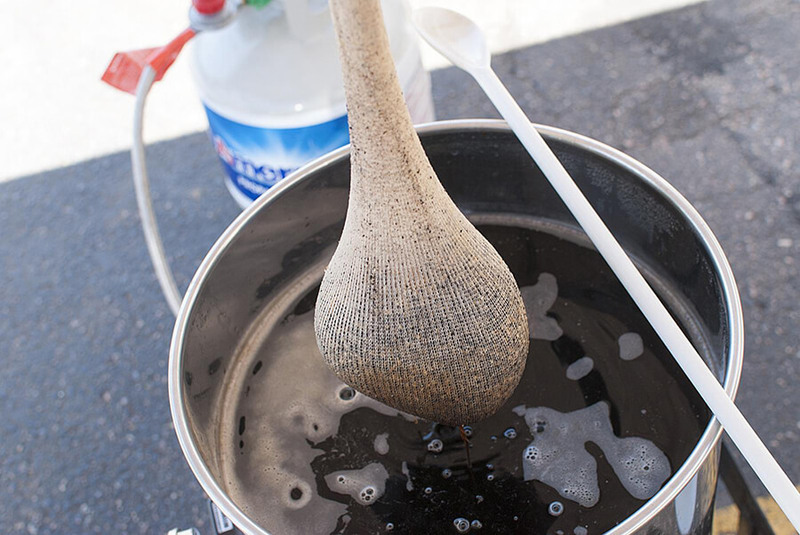 Incorporate the water into the grain bag so that all of the grains are fully saturated. Put the lid on the pot and allow the grains to steep for 30 minutes without direct heat. After 30 minutes you can remove and discard the grain bag. With the heat still off, slowly pour the malt extract(s) into the pot. Stir well to ensure that it is completely mixed with the water. Turn the heat back on, set to high and bring the contents (now called wort) to a vigorous boil. We will be boiling for a total of 60 minutes. The lid must remain off during the entire 60 minute boil to prevent potential off flavors.